Lovelies, New Year’s Eve is just around the corner! Can you believe it? We have all sorts of traditions for this time of year that we do as a family. 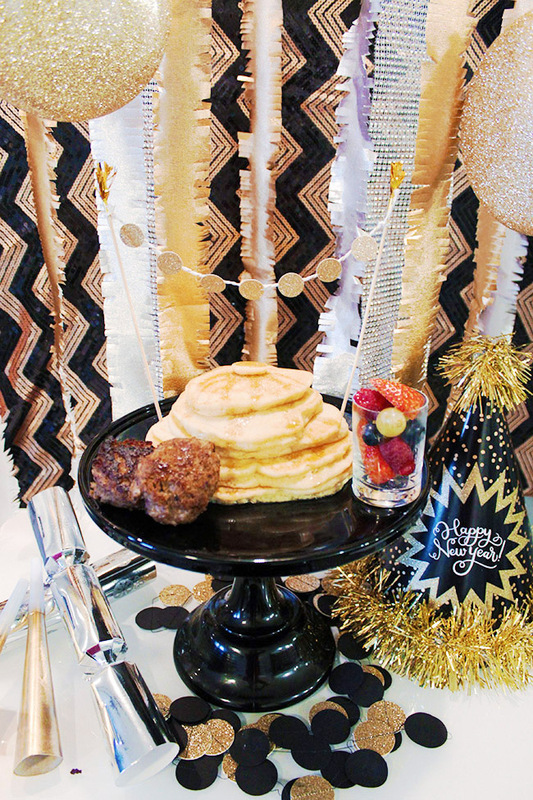 One of our favorites is sharing a big New Year’s breakfast together as a family and watching the Rose Parade. 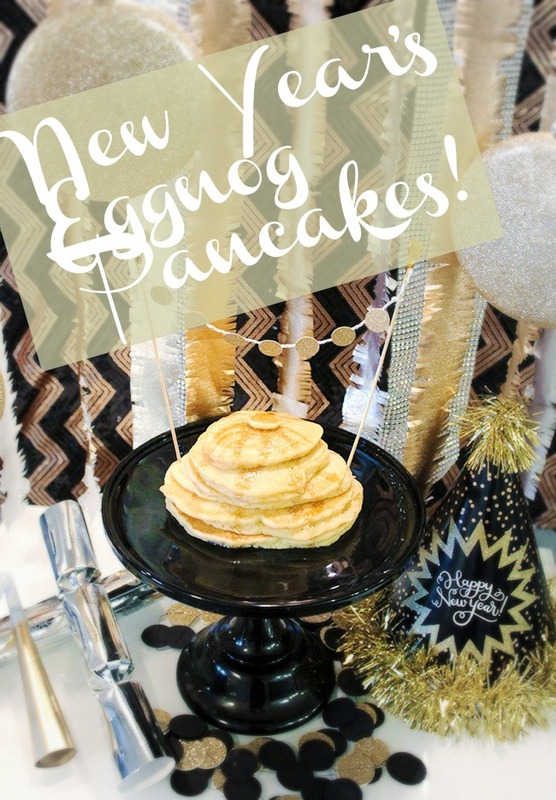 There are so many fun things you can do for New Year’s breakfast and today we have a lovely recipe for gluten free, dairy free eggnog pancakes! Breakfast is one of the hardest meals to plan for when you are gluten and dairy free. Just ask us, we are both gluten and dairy free! Luckily with all the alternatives out there you can whip something delicious, which is just what we have for you today! 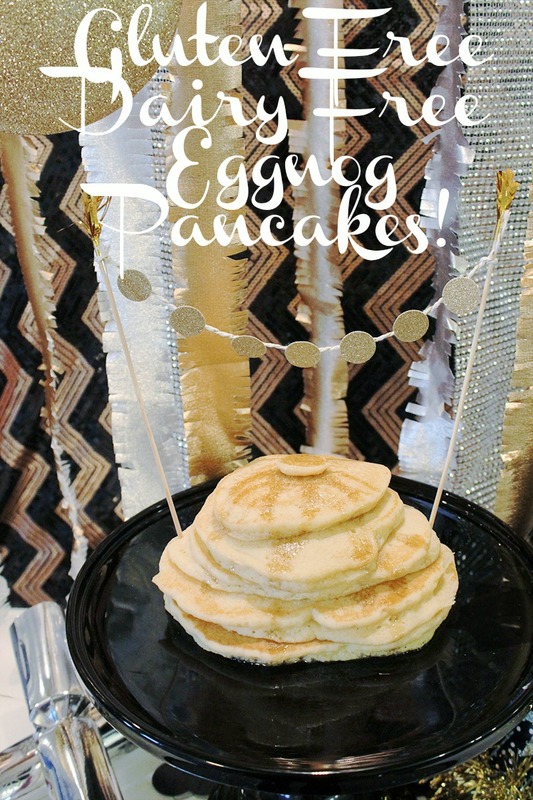 These Silk Eggnog pancakes are the perfect creamy and cozy flavor for this time of year and these pancakes are super easy to make. Only 4 ingredients and you are finished! 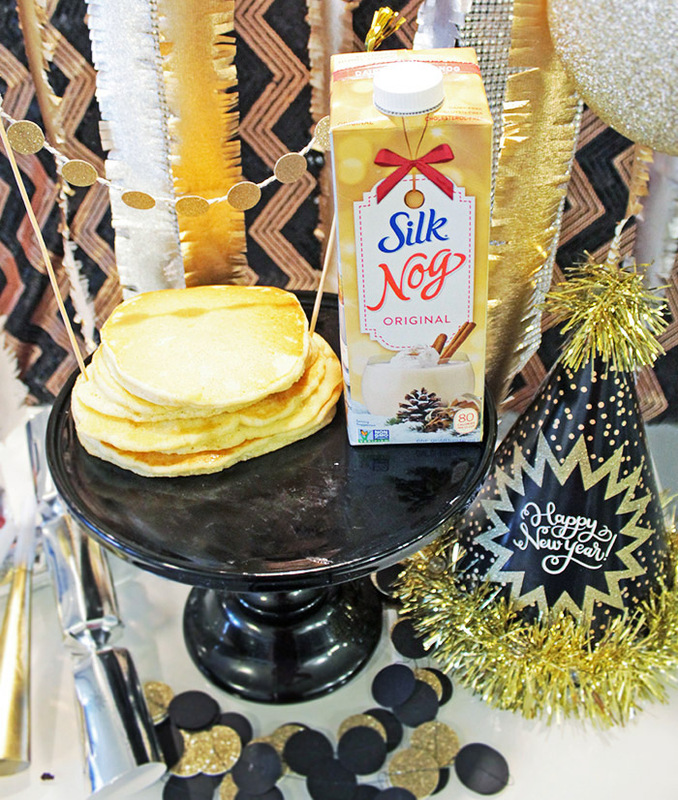 Perfect right?Kick off the New Year right with this amazing breakfast with Eggnog pancakes! 1. Whisk together The Eggs, butter and Eggnog together. Whisk in the pancake mix. 3. For perfect pancakes, pre-heat your griddle to 350. A skillet will also work on medium to medium high heat. 4. Scoop the batter onto a lightly greased griddle or pan. 5. Cook for 1 to 2 minutes untul bubbls form on the tops of the pancakes ad the bottoms are golden brown. 6. Flip and cook for ` to 2 minutes on the otherside. Serve hot with your favorite syrup and dairy-free butter! PS! Silk has Almond Nog and Pumpkin Spice that can be used in this recipe too. I know, we are thinking the same thing. Pumpkin Spice pancakes…Yum! All of them are amazing though so we recommend trying all 3! Silk has even more Holiday recipes that are fabulous too plus a free digital holiday recipes book and coupons. So Pop On Over There for even more festive flavors! Of course you have to decorate for New Year’s too and we are totally loving fringe streamers this year! There are some fun gold and silver ones you can pick up from stores this year that are metallic and lovely and perfect for New Year’s Eve. Simply fold the streamer in 4 parts and cut small slits along the sides. unfold and boom! You have a fringe stream like the ones pictured above. Poppers or Crackers are also always part of our New Year’s traditions. Popping them when the ball drops and the clock strikes 12 is such a fun way to celebrate. Plus there are always fun things inside of them like candy, puzzles and small toys. You never get the same one twice so it is so fun to see what everyone got! 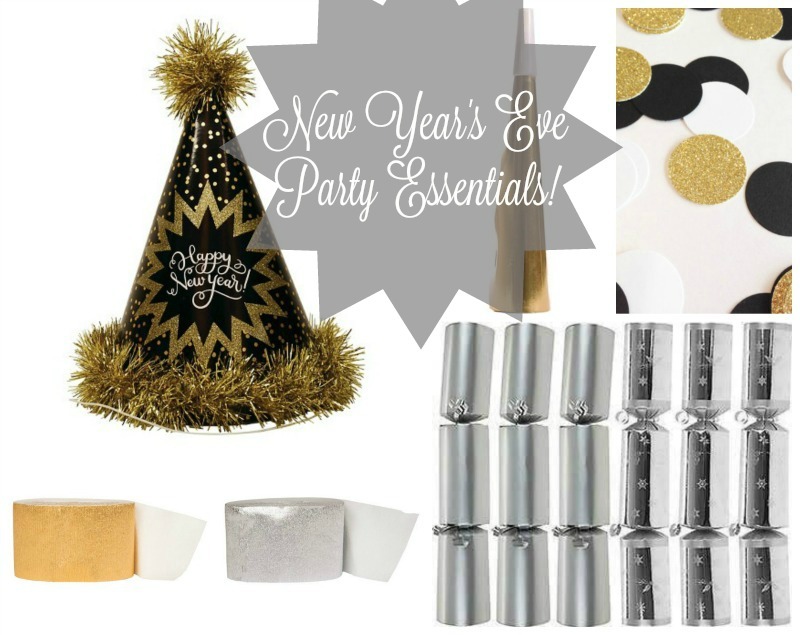 Party hats, confetti and noisemakers also are a must every New Year’s Eve too. The combo really allows you to celebrate to the fullest. Wearing a party hat is always in style and pretty much any celebration is amazing with confetti so really can’t go wrong celebrating with these 3! 10+ New Years Free Printables! Pancakes, Pancakes & Pancakes!! 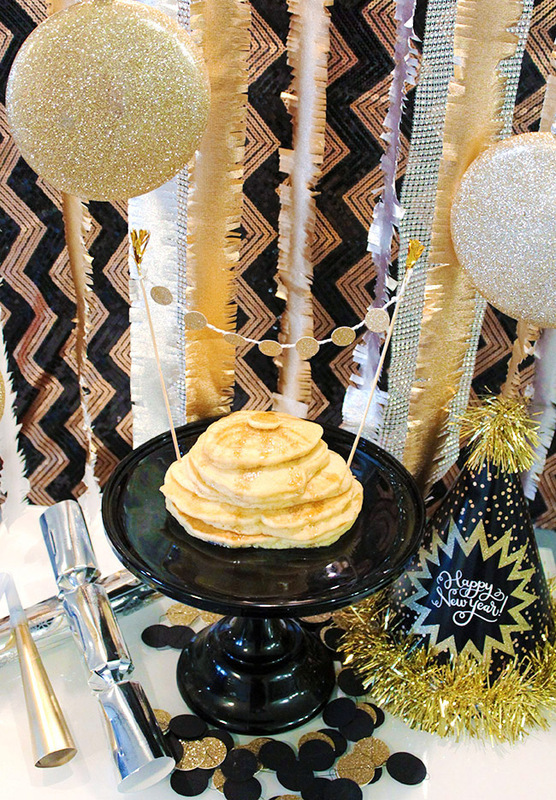 Inspiration Of The Day Our Favorite DIY New Year’s Crackers! This looks absolutely fantastic! I love the Silk Nog. For years, milk would make me sick so I started drinking Silk and even though now I can have milk, I still prefer the Silk Nog. This is something I will definitely be trying. Eggnog pancakes, whatt??! These look so good and perfect for the holiday! Thank you for sharing! I would have never thought of this! Sounds awesome! These are perfect for our family because my son is gluten and dairy free due to allergies! I am dairy free, myself. LOVE Silk Nog…it’s so good!